DEFECT: The bow section of the fiberglass hull structure may show signs of gelcoat crazing below the cabin area of the vessel. This may weaken over time to a point where the fiberglass structure could crack. HAZARD: In certain situations, the hull may crack causing water intrusion and possible submersion causing injury or death. What should Consumers do: Consumers should immediately stop using their vessel and make a booking with their Local Savage dealer for the required product inspection and assessment. 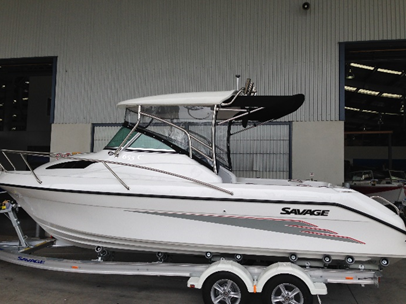 Contact details: Locate your nearest Savage dealer by visiting www.savageboats.com.au or email recall@telwater.com.au or call +61 (7) 5585 9898 during office hours. Contact details: Locate your nearest Savage dealer by visiting www.savageboats.com.au or email recall@telwater.com.au or call +61 (7) 5585 9898 during office hours. Click here to view list of potentially affected boat serials.